The Trump administration’s federal hiring freeze is creating uncertainty for Alaska’s national parks. A Jan. 31 announcement that seasonal employees may be exempt from the order eased some of the stress on national parks. But there are still questions about the future, including for Alaska’s most-visited national park. 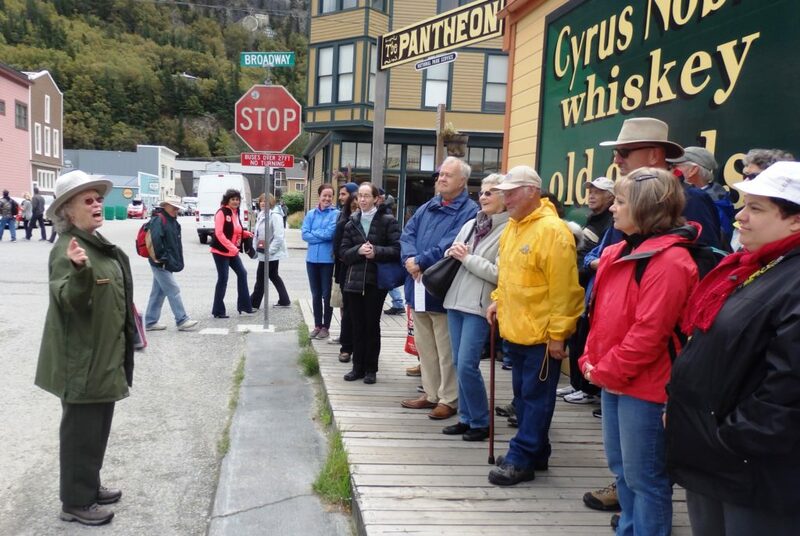 On a walking tour near the end of 2016’s tourism season, park ranger Charlotte Henson led a group of cruise ship visitors on a tour of Skagway’s historic sites. Henson is one of about 30 seasonal staff who work for the Klondike Gold Rush National Historical Park. They help serve the extreme influx of visitors Skagway sees each summer, from cruise ships. The busy season is about three months off. It’s around this time of the year that the park starts hiring its seasonal workers. They lead tours, maintain historical buildings, and oversee the U.S. section of the popular Chilkoot Trail. The park also employs about 30 permanent staff. Whether federal agencies like the park service could fill seasonal and permanent jobs was thrown into limbo when President Donald Trump took office in January. Ben Hayes is chief of interpretation for the Klondike Park. He read a prepared statement and referred other questions to the offices overseeing the seasonal exemptions. Meeting the needs of park visitors to Skagway requires a robust staff of park rangers and other employees. The town of less than 1,000 year-round residents has close to a million cruise ship visitors between May and September. And the historic Chilkoot Trail sees more than 10,000 hikers each year. The exemption to the hiring freeze requires some administrative oversight. The park service will have to clear its seasonal hiring plans with the federal Office of Management and Budget. KHNS contacted the Office of Personnel Management, the park service and the Dept. of Interior to learn how long it might take to approve seasonal hiring plans. None responded by deadline for this report. According to CNN, the park service as a whole relies on about 8,000 seasonal employees. KTUU reports that Alaska’s national parks employ about 500 seasonal workers. “A lot of individuals are deciding where they’re going to spend their summer. And that tipping point is right now,” Reed McCluskey, a retired park service employee, said. McCluskey oversaw hiring for the Klondike Park for about seven years, and before that served as chief ranger. He retired in 2012. Even if the park is able to fill its about 30 seasonal positions, hiring permanent staff is still on hold. Hayes was not able to provide the number of open positions the freeze has affected so far. And, when the freeze ends, there could be permanent reductions. The Trump administration directed the Office of Management and Budget to create a long-term plan to reduce the size of the federal government’s workforce through attrition. Once that plan is in place, the hiring freeze will expire. Skagway Mayor Mark Schaefer says if the Klondike Park were to lose year-round positions, it would impact Skagway’s already high unemployment rate during the off-season. In December of 2016, Skagway had a 20 percent unemployment rate, which is the highest in the state.